Our unique "Micro Coating" eliminates nutrition loss and water clouding. The premium-select marine & vegetable protein mix is ideal for small tropical fish who require larger energy reserves. A balance of Krill and Spirulina offers vivid coloration. This precisely colored granule improves underwater visibility thereby resulting in more rapid acceptance with less uneaten food. A softer texture that's ideally suited for most smaller community tank fishes. Feed two to three times daily the amount your fish will completely consume in a few minutes. Care should be taken to avoid over-feeding as water quality issues can result. Developed, produced and packaged in our facilities so we can be assured you'll always get the Hikari® quality you expect! 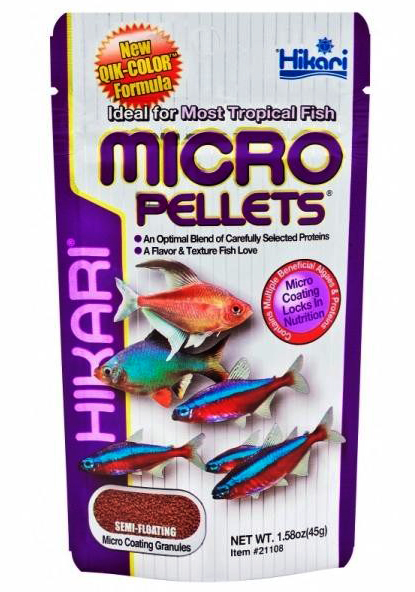 Note: HIKARI® TROPICAL MICRO PELLETS® contain higher levels of natural ingredients which may cause a slight change in color from one production lot to another. Rest assured because of our rigid quality standards each package meets our superior nutritional specifications.